What is Growing On with Jack Rabbit? 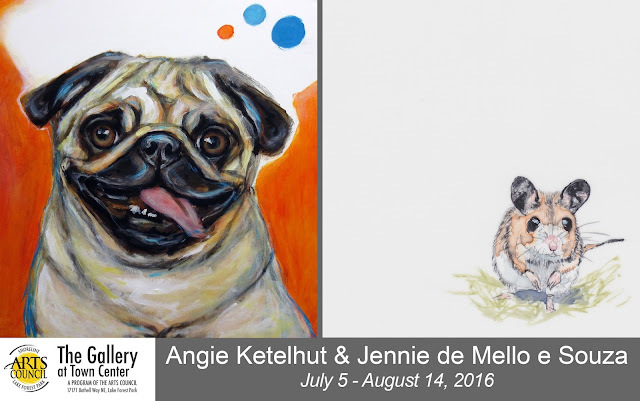 The Gallery at Town Center in Lake Forest Park is exhibiting a selection of works by artists Angie Ketelhut and Jennie de Mello e Souza, opening Tuesday July 5, 2016. See these works and the creations of over 90 other local artists during gallery hours: Tuesday – Saturday, Noon to 5pm. An artist reception will be held at the Gallery on Thursday, July 21 from 5pm to 7pm. Angie Ketelhut grew up in the Midwest USA and received a BFA in Illustration from Minnesota State University, Moorhead. Her expressive painting style and use of vibrant colors captures and honors the furry friends who bring so much joy and happiness to our lives. Ketelhut has sold her work internationally and offers custom portraiture through her website, She now resides just outside of Seattle with her husband, son, and Boston Terrier. Jennie de Mello e Souza’s background is in scientific illustration and art history. A few years ago, she decided to venture in a different direction, moving away from the realistic, and precise rules scientific illustration, and beginning to explore her limits of abstraction. This was a challenge after years of painting so precisely. To be able to improvise, to evoke a feeling, and to instill sentiment into a painting instead of scientific inquiry and exactitude was like "free-falling and flying at the same time." Her paintings are layers of colors, and paint is allowed to bloom and run. Sometimes a painting happens almost subconsciously, and colors seem to paint themselves. Other times, the layers build up and seem to speak through each other, making a whole that is intricate and interdependent. de Mello e Souza hopes it helps her viewers feel some emotion; entirely personal, precious, and beautiful. de Mello e Souza lives and works in Edmonds, Washington.